The top reasons for a deadly prescription in Oregon is fear of losing autonomy (91.5%), of being less able to engage in activities (88.7%) and loss of dignity (79.3%). Assisted suicide is not really about pain or fear of it (24.7%), it is about fear of becoming dependent on others. That “choice” is no reason to endanger vulnerable people who will be pressured with a duty to die or open obvious pathways for abuse, neglect and abandonment of our elderly. We can do better in Connecticut with compassionate choices – such as expanded options for early hospice care, a “right to try” bill, training for doctors in cutting edge pain management and increased funding for home health and attendant care. In addition to all this, legalizing assisted suicide laws must be one of the worst solutions to aid people near the end of life. It would only be accessible for privileged people who can plan and navigate the necessary hurdles of waiting periods, second opinions, witnesses and more. Hundreds and thousands more Connecticut residents would truly be served if the state stayed focused on care, not killing. In the spring of 2014, the Los Angeles Times editorialized that their state should adopt an assisted suicide law and extend it to children. At a Compassion & Choices’ press conference at the Connecticut State Capitol Building in February 2013, one of the speakers advocated extending any future Connecticut “aid in dying” law to the mentally incompetent. At an October 2014 event in Hartford, Compassion & Choices President, Barbara Coombs Lee stated with regard to including people with dementia and cognitive declines, that “It is an issue for another day but is no less compelling”. 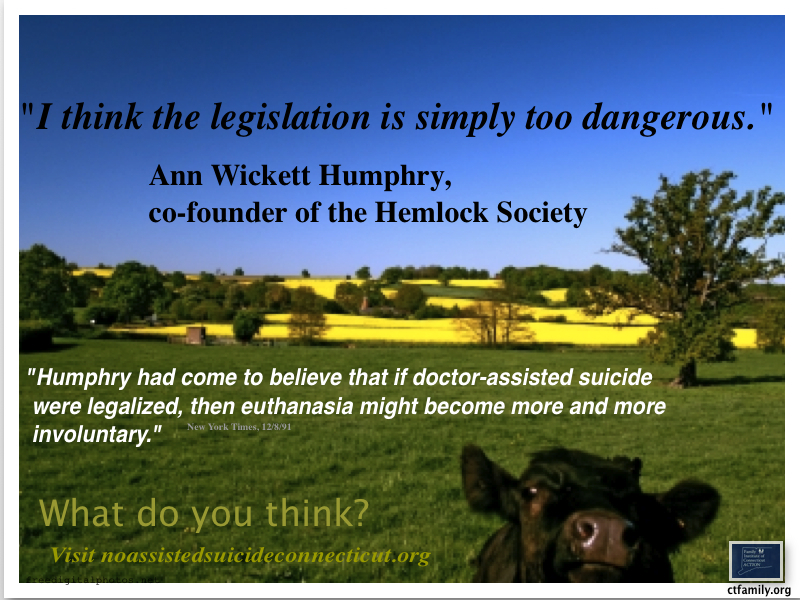 Compassion & Choices is the successor to The Hemlock Society. The Final Exit Network advocates suicide and euthanasia for people “when they judge the quality of their life to be unacceptable”. These statements, among others, reveal a broader, more radical agenda. Advocates of assisted suicide assert that there has never been one case of abuse related to laws legalizing assisted suicide. Setting aside the inherent flaw of making such a broad assertion about a program designed and implemented by human beings, with a program as complicated and dangerous as assisted suicide, that claim is simply not supported by the facts. For a list of abuse cases that were uncovered through media reports visit http://dredf.org/public-policy/assisted-suicide/some-oregon-assisted-suicide-abuses-and-complications/. The Vermont Alliance for Ethical Healthcare prepared an overview of many abuse and misuse cases from Oregon. A complete list may be found at their website. http://www.vaeh.org/resources/ We have copied a few cases and reprinted them below for your information. Kate Cheney, 85, had terminal cancer and told her doctor she wanted assisted suicide. Concerned that she didn’t meet the required criteria for mental competence because of dementia, he declined to write the requested prescription and instead referred her to a psychiatrist as required by law. She was accompanied to the psychiatric consultation by her daughter. The psychiatrist found that Kate had a loss of short-term memory. It also appeared that her daughter had more interest in Cheney’s assisted suicide than did the patient herself. The psychiatrist wrote in his report that while the assisted suicide seemed consistent with Kate’s values, “she does not seem to be explicitly pushing for this.” He also determined that Kate did not have the “very high capacity required to weigh options about assisted suicide,” and he declined to authorize the lethal prescription. Kate seemed to accept the psychiatrist’s verdict, but her daughter did not. Her daughter viewed the guidelines protecting her mother’s life as obstacles, and in a press interview called the guidelines a “roadblock” to Kate’s right to die and demanded that Kate’s HMO, Kaiser Permanente, provide a second opinion. This was provided by a clinical psychologist (rather than a MD-psychiatrist) who also found Kate had memory problems. The psychologist also worried about familial pressure, writing that Kate’s decision to die “may be influenced by her family’s wishes.” Still, despite these reservations, the psychologist determined that Kate was competent to kill herself and approved the writing of the lethal prescription. Sometime later, Kate went into a nursing home for a week so that her family could have some respite from care giving. After she returned home, she declared her desire to take the pills. It is possible to circumvent the safeguards by “shopping” for an agreeable professional to write the lethal prescription. By giving the interview, the patient’s daughter unintentionally revealed that the law does not adequately protect patients with diminished capacity from family coercion. Did financial considerations influence the HMO director to write the prescription? Dr. Charles Bentz, an internist in Portland, Oregon, diagnosed a malignant melanoma in a 76 year old man who had been under his care for over 10 years. Unfortunately, the cancer had already spread to his shoulder at the time of diagnosis, so it was not curable. Dr. Bentz referred this active man to both radiation oncology and medical oncology, using two methods to slow the cancer and prolong the man’s life. When the patient finished the radiation therapy, the radiation oncologist informed Dr. Bentz that the patient was depressed due to his diminished physical stamina. At almost the same time, he finished his chemotherapy and asked his medical oncologist for a prescription so he could take his own life by suicide. The medical oncologist called Dr. Bentz asking him to act as the required second physician to confirm the diagnosis and prognosis before he wrote the prescription, saying secobarbital “works very well” and indicating he had used it many times. Dr. Bentz responded that he could not do this; the man had a documented depression and needed therapy for this. The oncologist then found another physician to render the required “second opinion” and did not refer the man back to his primary physician. Two weeks later the patient was dead from a lethal prescription. Dr. Bentz obtained permission from the man’s family and obtained a copy of the death certificate which said death was from malignant melanoma. His well-documented depression was not evaluated by a mental health specialist, nor was it treated. His primary physician was excluded from helping him with his end-of-life concerns. His oncologist falsified a public document by lying about the cause of death. This 64 year old woman had a recurrence of her lung cancer in May 2008, 2 years after initial treatment had produced a remission. Her oncologist prescribed Tarceva (erlotinib), a once daily tablet, to slow the growth of the cancer and extend her life. Studies had shown it resulted in a 30-45% increase in life expectancy in advanced lung cancer. She was on the Oregon Health Plan (Medicaid) and was notified in May that the Plan would not cover the beneficial chemotherapy treatment, “but that it would cover palliative, or comfort, care, including, if she chose, doctor-assisted suicide”. Coverage by the OHP for specific services are established by its Health Services Commission. Their guideline states that they will not pay for diagnostic or curative care for the primary illness or care focused on active treatment of the primary illness which are intended to prolong life or alter disease progression for patients with <5% expected 5 year survival. Neither Barbara’s nor Randy’s prognosis fit into this guideline. But physician-assisted suicide did. Assisted suicide is not dignified. Assisted suicide does not guarantee dignity at the end of life. Prescription drugs can cause fearful, messy and undignified moments during a hastened death. Statistics are not kept on “aid-in-dying” failures, but there are news reports of panic stricken relatives calling 911, emergency room visits, hallucinations, vomiting and choking. A study from the Netherlands (which has far more experience than Oregon or Washington with “aid- in-dying”) reports that in at least 18 percent of reported physician-assisted suicides, doctors felt compelled to intervene and administer a lethal injection themselves because of “complications”. Proposals in Connecticut have not required a physician to be present when death-inducing drugs are administered. To what fate would we be subjecting the weakest of Connecticut citizens with the false promise of an easy death? Oregon issues an annual Suicides in Oregon: Trends and Risk Factors report. According to the 2012 report, after decreasing in the 90s, Oregon’s suicide rate has increased to 41% above the national average. Laws such as Oregon’s Death with Dignity Act portray suicide as a reasonable means to solve a problem and vulnerable people in that state appear to be viewing suicide the same way. We should not be exalting suicide as the ultimate form of expressing one’s “choice”. Oregon’s report was also cited in the Connecticut Office of Legislative Research Report, December 13, 2013. Out-of-state funded proponents have placed their slick advertisements promoting suicide as an solution to problems at the Connecticut state Capitol. We question the effectiveness of such ads, but more importantly note that thousands of school children pass through the corridor of the Legislative Office Building each year. These campaigns have been denounced by anti-suicide organizations such as the International Association of Suicide Prevention as “irresponsible and downright dangerous; it is the equivalent of handing a gun to someone who is suicidal”. We discourage our state legislators from permitting ads promoting illegal activity and suicide as a way for self-empowerment and problem solving. 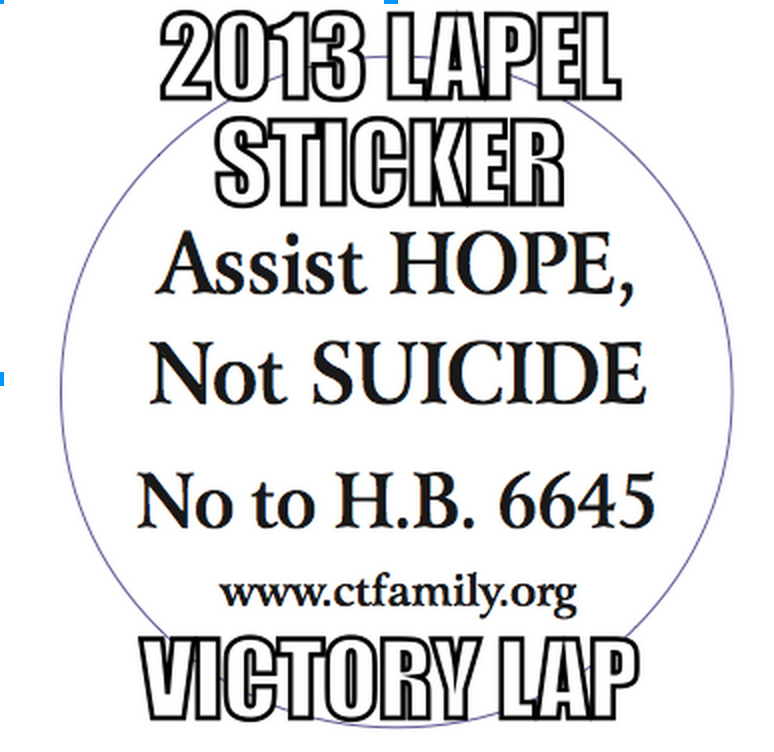 Assisted Suicide is not a silver bullet to eliminate pain in CT. In fact, assisted suicide has not been proven to alleviate suffering at the end of life – it likely causes more anxiety, distress and eliminates choices at the end of life. One study showed reports of pain at the end of life actually increased in Oregon from 1997 to 2002. 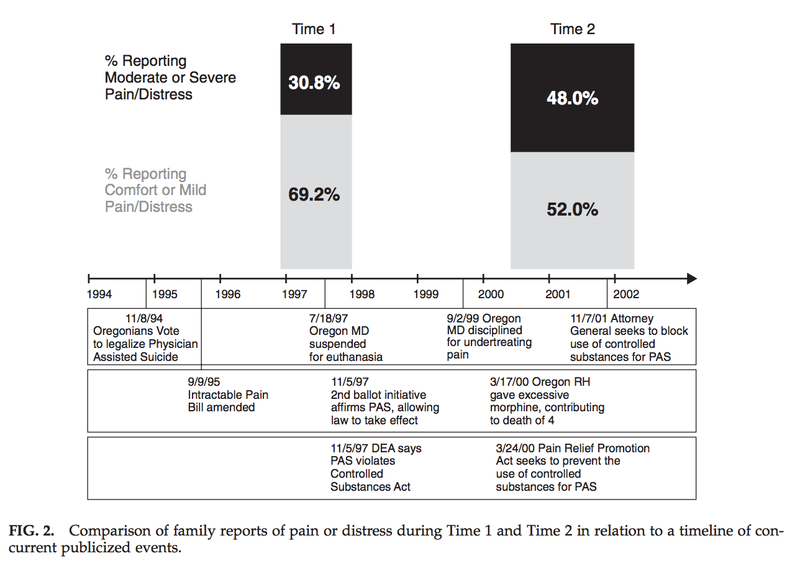 Increased Family Reports of Pain or Distress in Dying Oregonians: 1996 to 2002, Journal of Palliative Medicine, Vol. 7, No. 3 (2004). The last days of polka. The Connecticut Legislature should consider the extension of “aid in dying” practices in Belgium and The Netherlands to twin brothers who suffered from glaucoma and back pain and to a person euthanized because they suffered a botched operation. “Loss of fitness” is now considered an underlying condition for cases worthy of euthanasia. In 2015, an elderly couple plans to jointly commit suicide by lethal injection so their children will not be “burdened” by having to care for only one aging parent. The Connecticut Legislature must consider the true long term cost of legalizing assisted suicide. In a March 3, 2015 letter to the editor, Connecticut doctor, Linda Alexander advocated providing “any treatment” to “all who request it” – this encompasses euthanasia on demand. Her letter is an example of why the Connecticut State Medical Society opposes physician assisted suicide. With a license from the state, many medical personnel will be unable to avoid the temptation of social expansion of assisted suicide to people outside of the “carefully” selected categories. For more information on this phenomena, consult this academic article: Legalizing Euthanasia or Assisted Suicide, the Illusion of Safeguards and Controls. 2014 Position Statement by CMF New Zealand, Euthanasia and Physician Assisted Suicide. Response to LA Times editorial by American College of Pediatricians. Testimony of Peter Wolfgang, Executive Director of Family Institute of Connecticut against HB 5326, 2014’s assisted suicide bill. A majority of Connecticut residents (55%) believe doctors should not be allowed to prescribe or administer fatal drugs. Additionally, only 21% believe doctors should be allowed to assist a patient in taking their own life. ASSISTED SUICIDE ENDS THE PATIENT, NOT THE PAIN.